Dr. Joseph Noble and our caring dental team strive to provide the highest quality of care to families in the area because we care about our community and those in it. We serve the needs of many military families and first responders who need quality dentistry. We know that you work hard to protect us. We want to help protect you and your family by providing the dental services your family needs to develop and maintain healthy, beautiful smiles. The health of your teeth and gums play an important role in your dental health and overall quality of life. If they are not protected with regular dental care, serious oral and overall health complications can occur. We do not want to see that happen. We want to provide you and your loved ones with the care they deserve because you work hard to keep us safe. We treat patients of all ages through every stage of life at our full-service practice. 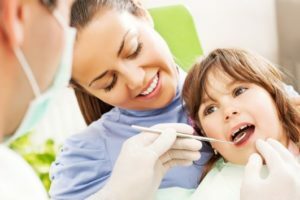 With preventive services, like cleanings and checkups, we will help to foster the health and development of your family’s teeth and gums for beautiful smiles that will last for a lifetime. We provide the caring and compassionate services your loved ones need to feel at ease while in our office—including young children. With a personalized treatment plan, we work to promote optimal oral health. However, there may come a time when your loved ones need restorative dentistry to rehabilitate the teeth and gums. We use the most advanced technologies to ensure comfort while providing accurate and precise results. In addition to the health of the mouth, the appearance of the teeth is equally as important to help your family feel confident. We offer a variety of cosmetic procedures to create beautiful smiles. To ensure your entire family’s needs are met from one location, we offer many areas of specialty, including dental implants and TMJ therapy. We also offer emergency dentistry to always be there for your family, like you are always there for the community. It is our mission to develop and maintain lifelong relationships with each of our patients. We work hard to ensure your loved ones feel comfortable and relaxed to enjoy their time while in our office to create generations of healthy smiles. You work hard to protect us. Now, it is our turn to protect your loved ones with complete dental care, so you have one less thing to worry about. Experience Southern hospitality and family-friendly care with Dr. Joseph Noble and his dedicated team today. For more than 20 years, Dr. Joseph Noble has been improving smiles in the area. With a family focus, he strives to provide exceptional care to patients of all ages while promoting optimal oral health through all stages of life. If your family needs high-quality dentistry, contact our office today to schedule a consultation with Dr. Noble. He will treat your family as his own while he creates healthy teeth and gums.